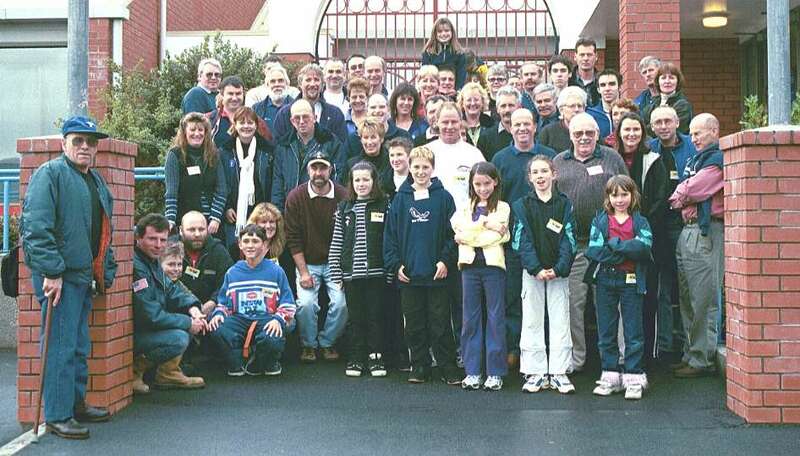 This page provides brief descriptions and photos from club events during 2001. National Convention, Palm North, 19-22nd Oct. Awesome! Click this link for full details. The club members assembled at 11 am in Palmerston North at the Rose and Crown English Pub in Ruahine Street. Of immediate interest was a lovely red 2001 Cobra convertible ..the first new Cobra to enter the club stables. (see photo). Amid much discussion members enjoyed a pub lunch and few drinks, then assembled for the formal meeting. Key business on the agenda was to update members on arrangements for the coming Convention, and to allocate some key jobs to volunteers. The meeting over, a number of cars proceeded up the road to the Power house Museum, a relic of the electricity generation in PN city in the 1920 and 30's. Two huge 1 MW marine diesel engines are still inside the power house, and both are capable of being run up, although they presently cannot generate because of damage to the wiring cause by vandals. Of particular interest was the antique control panels and switch gear mounted on slabs of tile and marble. Very well attended in spite of a horrible weather forecast. 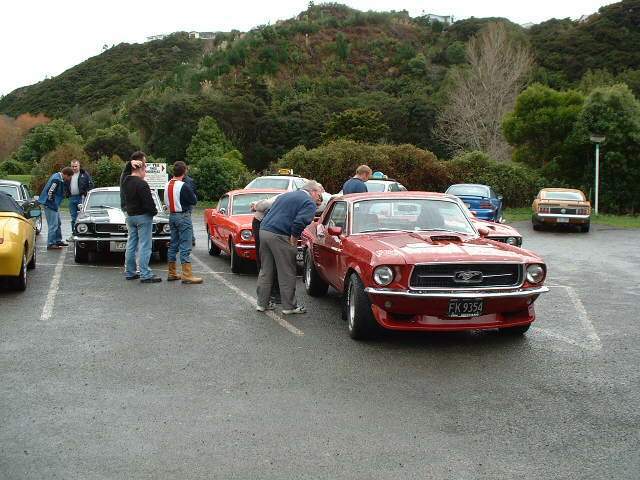 Wellington members actually drove up in bright sunshine, and meet about 25 other mustangs from the Manawatu club as well as a few from the Taranaki Club. A brand new silver 2001 Cobra was on display, and the club line-up helped show off the new car very successfully. After a great BBQ lunch provided by Wanganui Motors, members lingers to chat over their cars, and a few wandered downtown and tried their hands at 10 pin bowling. 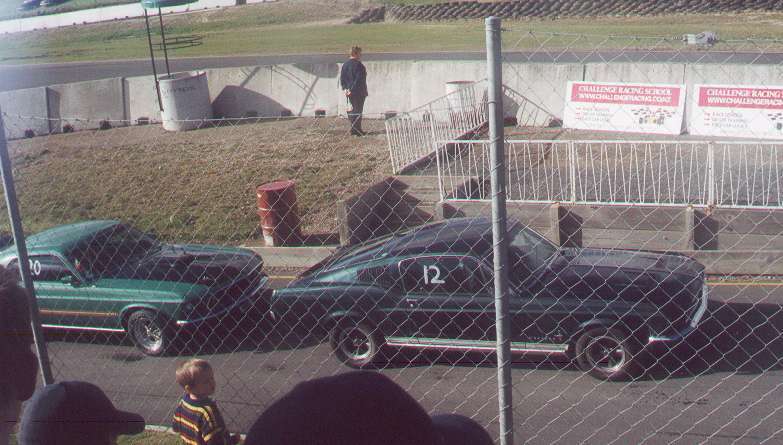 Masterton Meeting: Sunday 22 July 2001. Another meeting on a very wet weekend, but well attended, nevertheless. .....Chevy Chicken !!! ie too chicken to race..! Club meeting held at the Whitby (Duck Creek!) Golf Club rooms. The heavy rain dampened outside activities, but inside the members enjoyed a meal, and videos and pictures of the recent Taupo Meeting, with presentations of prizes. 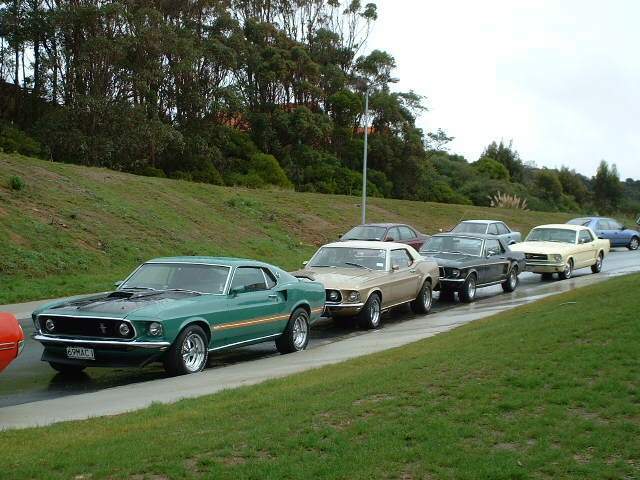 the 20 Mustangs attending then headed out for the Police Museum, a place with exhibits to keep everyone fascinated! 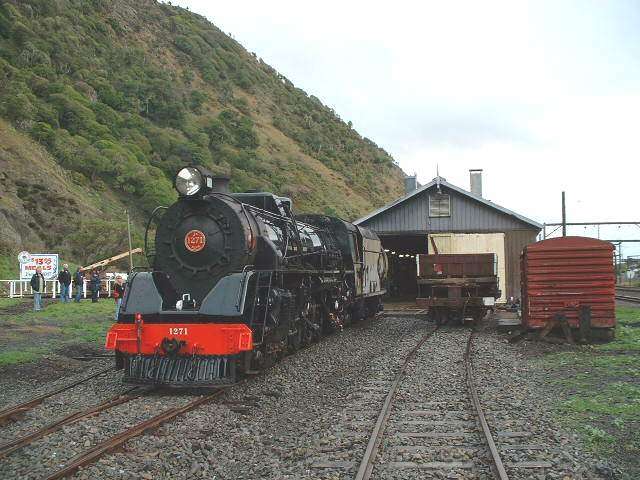 The remaining souls then braved the worsening weather headed up to Paekakariki to check out the steam Locos at "Steam Incorporated." 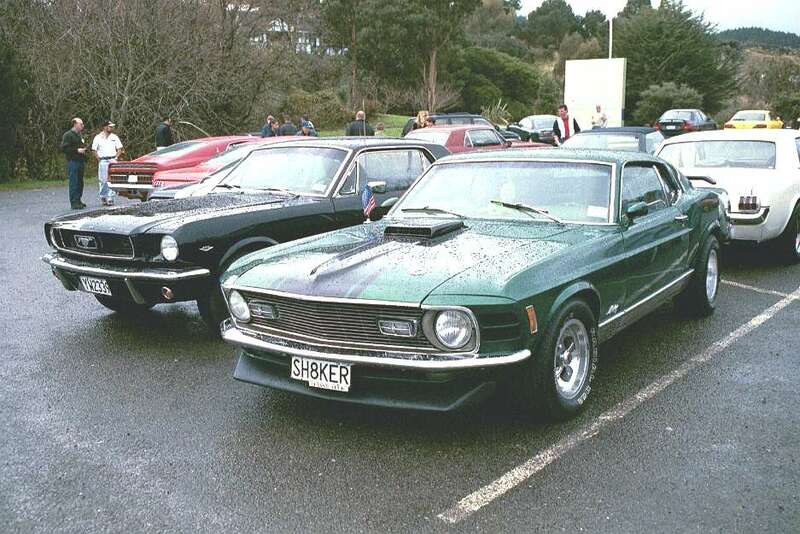 The club combined with the Ford Muscle Club for a day of dual sprints at the Taupo racing circuit. The day was cloudy, and a cool wind was zipping across the site, but the forecast rain held off. 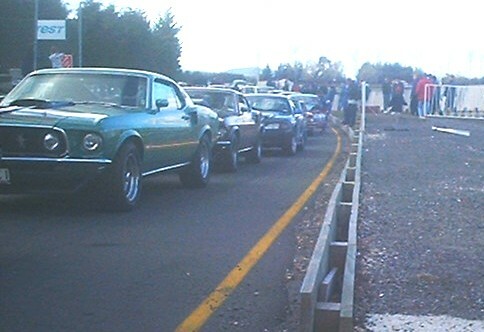 About a dozen MMOC cars joined at least twice as many other cars, and of particular note were several very rapid Falcon GT and GTHO's, as well as dedicated track cars of varying descriptions. After the morning practice a few of the MMOC cars retired with various problems (or the drivers had adequately vented their racing instincts), and after lunch the remaining cars were let loose again. Starting grids consisted of just 6, with the cars started in pairs approx 10-15 seconds apart. This approach lessened the congestion on what is quite a short tight circuit, and with it, the chances of collision damage. Lap times for club cars were in the 1 min 50 sec area for the quicker cars. All in all a very exciting and really enjoyable day for those that came. There was much discussion about making it an annual event. Held on 1 April 2001, beside the Ohakea Airbase at Bulls. The weather was beautiful, and around 25 club cars had a fun day slidin around the tight and slippery grass course. Course times sharpened considerably during the day as drivers realised that the reason the women were cleaning up, was because the guys wild power slides on the corners (while great fun) were not the fastest way around the course. Held on 4 Feb 2001at Trentham racecourse Upper Hutt. 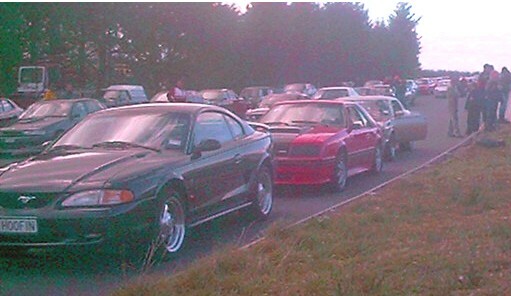 A huge turnout of cars of all types of classic US cars, hot rods and plenty of Mustangs, on a (very) hot summers day. 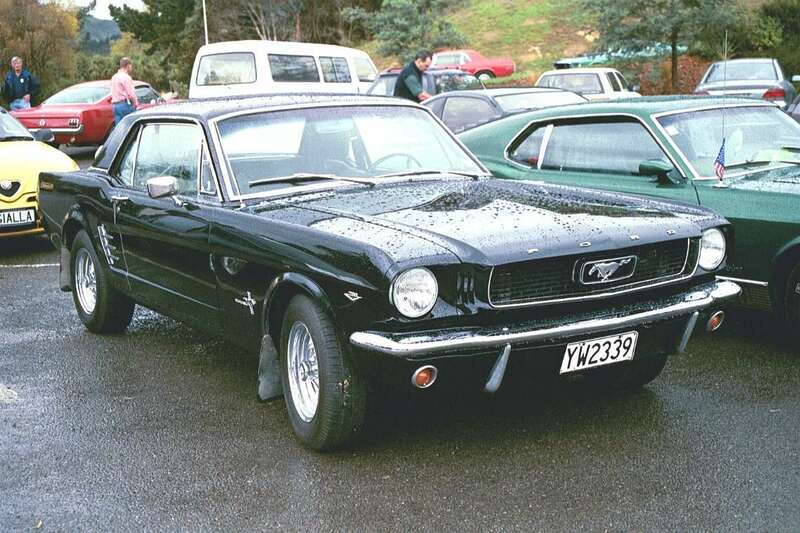 Those attending had a fabulous selection of all types of cars to droll over, as well as live rock and roll music. Held at the Te Kowhai reception rooms in Levin, on 10 Dec 2000. It was a beautiful sunny day and a very enjoyable time was had by all. The photo shows the club gathered after the Christmas meal. 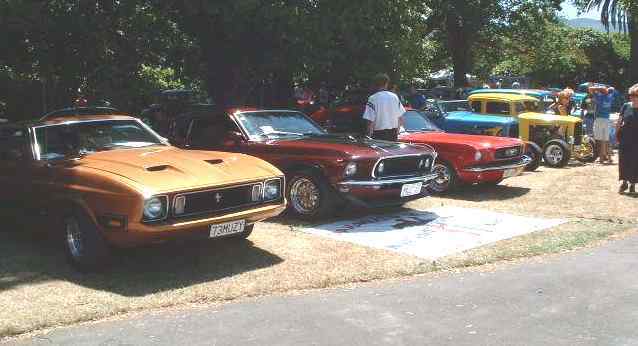 Held in Auckland the convention was attended by approximately 20 club members with 14 cars. General agreement was that it was an extremely well organised and enjoyable event. The photo shows members at the 60's theme, evening prize giving function.